Fit of rage; depth of sorrow; overwhelmed with happiness; bursting with joy; wracked with grief. Emotion is most often described in stark and extreme terms. Our language has developed over time to express emotion as a ‘freak’ occurrence; an instance or moment of irrationality: an irrepressible ‘outburst’. People are hotheads, manic, heartless, sometimes empty. These descriptions suggest again that our experience of emotions is unbalanced and inconstant; we are subjects to something unknown – chemical and intuited – something that happens to us. When studying emotions in history it is hard not to view events without referring to this accepted understanding of emotion. For example, it is expected that during the Blitz, either blind panic or spirited composure dominated civilian reactions to air raids. Emotions happen to these civilians, who have either become powerless in such an extraordinary situation or who have been taught how to overcome uncontrollable urges; we have come to expect people to have particular emotional responses and these have been written into our histories. But we are not at the whim of our emotions – not all of the time anyway. Emotion underpins our daily existence, it doesn’t just flare up at intense peaks. So in fact, we are experiencing emotions – different ones, simultaneously – all the time; and we are choosing when and when not to express those emotions distinctly, and when to simply let them be. In my research I will be expecting to find out about two much-discussed emotions: fear and anxiety. In the 1950s it has been assumed that Western populations experienced a high ratio of fear and anxiety in response to the nuclear threat and the geopolitics of the Cold War. This assumption has been made by historians judging moments of outrage, shock, horror and panic to describe an entire decade’s worth of individual, collective and plural emotions. By avoiding the presumption that emotions simply happened to ordinary people of the 1950s, I hope I’ll be able to better judge how far people had an agency in the expression of their feelings and in doing so, how deeply and regularly emotions of fear and anxiety were really felt. After all, if someone accused me of blowing my gasket, I’d at least like to be able to explain why I did, rather than have myself perceived, and perceive myself as, an inexplicable emotional explosive. 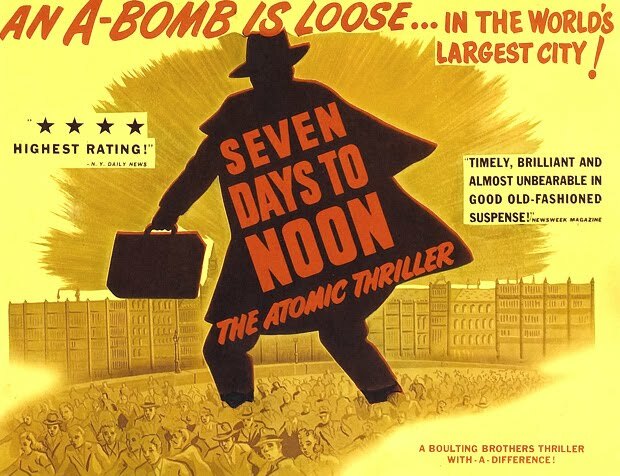 A thoroughly fear-inducing British film about a scientist who tries to put an ultimatum on government (to stop developing Cold War arms) by threatening to blow up London with his own A-bomb.